HR managers want to align both business and HR needs, as well as making sure the organisation has the right people, with the right skills, at the right cost. How? By planning their workforce! SWP gives managers, leaders and HR professionals insights regarding their current and future workforce while focusing on output, skills, functions and predictions. It looks across the organisation to see how employees both at an individual and group level contribute to improving the organisation’s performance and what could be improved in the future. Just imagine one of your top talents. To replace one of them you might not need another person, but you might need 3 people that all take a part of their job and do their own on top of that. Then, SWP comes in handy since you can look at past projects and use these as a basis. What functions do you need in the future? What roles did you need in the past? Are the skills HR wishes to have in line with what managers want? Are there any skill gaps? Agile organisations cannot afford to use job titles as an intermediate step to identify talent needs anymore. They can't anticipate the needs of their organisations by putting everything in deterministic boxes they can control. In static situations, you can still use job titles of course (non-screen workers, administrative people, service agents, call-centre workers, …). We designed a framework that puts your organisation's agility and Strategic Workforce Planning's complexity on two axes. Do you want to know more? 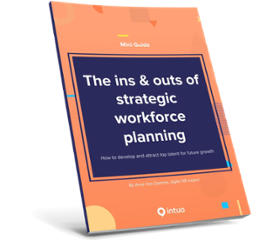 Download the Mini Guide on Strategic Workforce Planning.